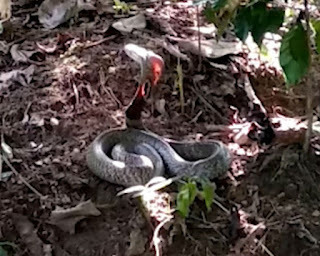 In Chikmangaluru, a unique snake remains a matter of curiosity among the people. At Chomangaluru's Holmaki village, people were shocked when they saw a rare species of cobra snakes in the field. Actually, the cobra was a red light on the head of a snake, which was full of people's attention and people even started worshiping him. The video of this red-light snake on the social media is becoming viral. In a viral video, a dog is seen barking in front of a cobra snake and a red light appears on the head of the snake. Actually, after seeing a snake sitting in a farm in Holmaki village, a dog starts to bark loudly. When the farm farmer is there by listening to the sound of a dog's barking, then he becomes confused by the red light on the head of the snake. He made a video of this whole incident on social media, which is now becoming viral. According to local people, this snake is often seen in a farmer's farm here. People believe that the snake has divine power and that is why he is also worshiping that snake. However experts say that this is not a miracle. The head of a snake does not get light from any species. Due to sunlight, the light of the snake is visible on the head.